Ernie Wash is located in the southern area of the San Rafael Swell between Green River and Hanksville, Utah. 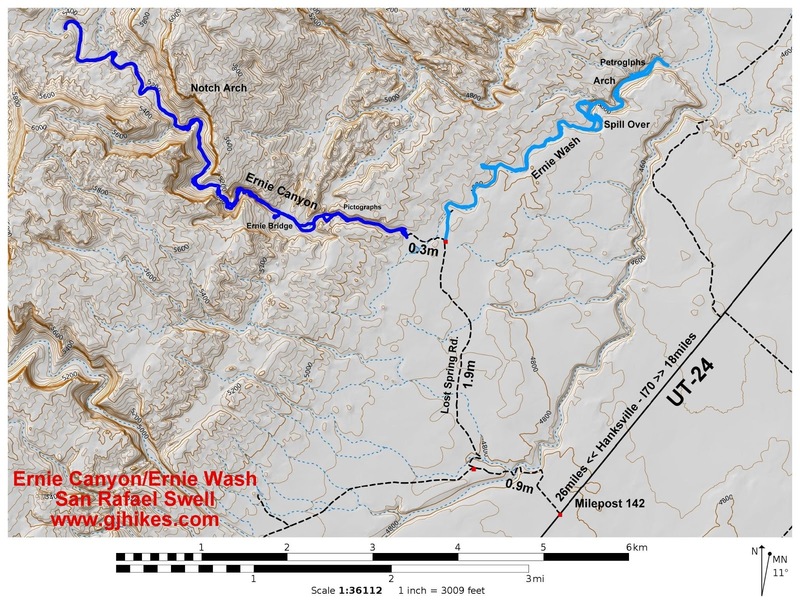 For this post we begin hiking in the wash, on the east side of the reef, a short distance from the mouth of Ernie Canyon. The hike follows the wash for several miles where it encounters a fun stretch of shallow narrows. A short distance past the narrows the wash plummets down a spillover into a canyon that is over 100 feet below. 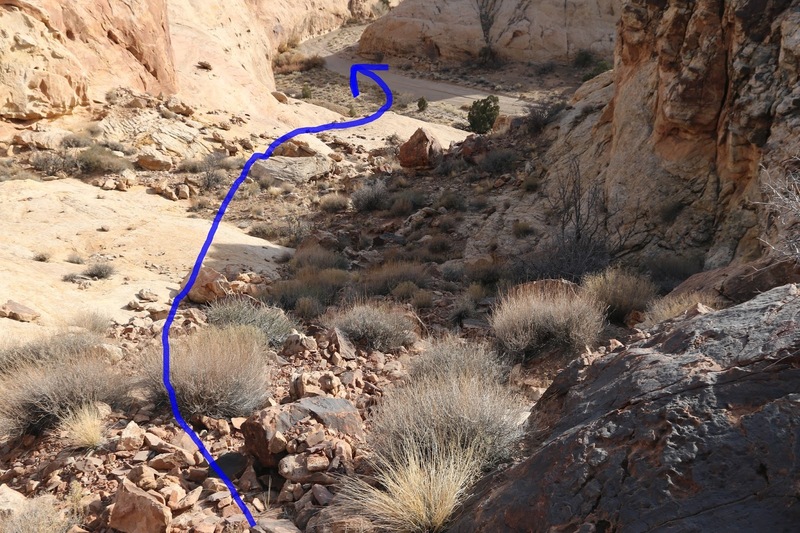 There is a route that leads around the spillover and back down into the base of the wash where the hike continues for another half mile or so. Along the way in the final stretch of the wash there is an interesting natural arch and a large cliff face with several panels of petroglyphs to exam. 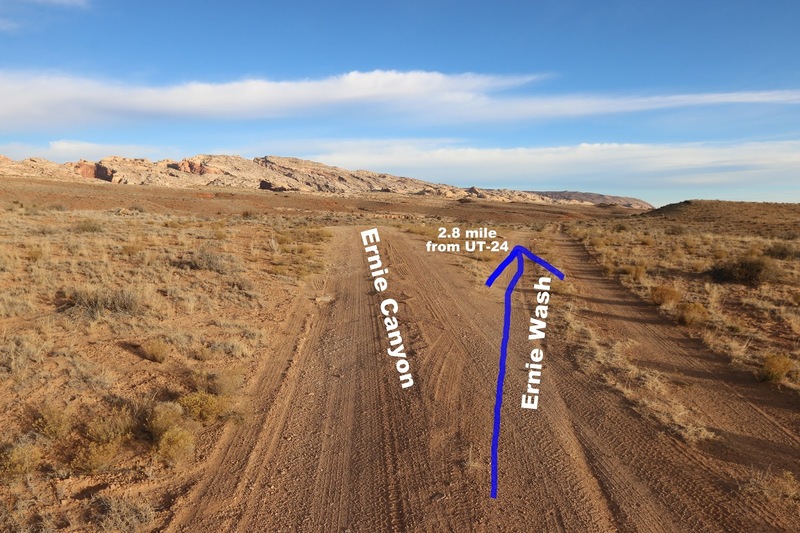 To get to the trailhead drive south on Utah Highway 24 from Interstate 70 for about 18 miles. Less than a half mile past mile marker 142 turn west on the unmarked Lost Spring Road. Measuring from the gate the road will cross a wash just past the half mile point that requires a high clearance vehicle. At the 0.9 mile point take the right fork and continue for another 1.9 miles to another fork where this hike begins by following the road to the right. The road to the left drops down the hill and crosses Ernie Wash where after a little more than a quarter mile it comes to an end at the Ernie Canyon trailhead. A person could just as easily begin from there and just add another mile to the round trip distance. 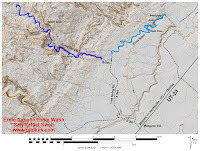 Whether you park on top of the hill at the fork or drive another quarter mile down the road there is a noticeable spot where you can enter the wash and begin hiking. If you do drive down the hill you might need a 4-wheel drive to get turned around. Hiking in the gravel bottom wash is pretty easy for the most part. There is a fun slot that comes up after hiking down the wash for about a mile and a half. We didn't want to enter a trap so we hiked above it on the trip out where we were able to determine that it looked unblocked and passable. On the return trip we stayed in the wash and hiked through its little slot. At the 2 mile point there is a big spillover that comes up. You can hike around it on the right and find a very steep route that leads back down into the wash. After taking a look at it we opted to check out the route going the other way because looking across the canyon it looked a lot safer. We didn't notice any repel anchors along the rim. There is a faint trail that leads around the west side of the canyon where you can find a much easier drop in point. There isn't a cairned route or anything but it isn't too hard to work your way down either the talus or the slickrock and back into the wash.
As you continue on down the wash there is an arch in the rim of the canyon high above wash. It isn't on our list of arches but a logical name might be the Ernie Wash Arch. The cliff face with the petroglyph panels comes up around the 3.2 mile point of the hike. There is a large panel that has a number of interesting images. 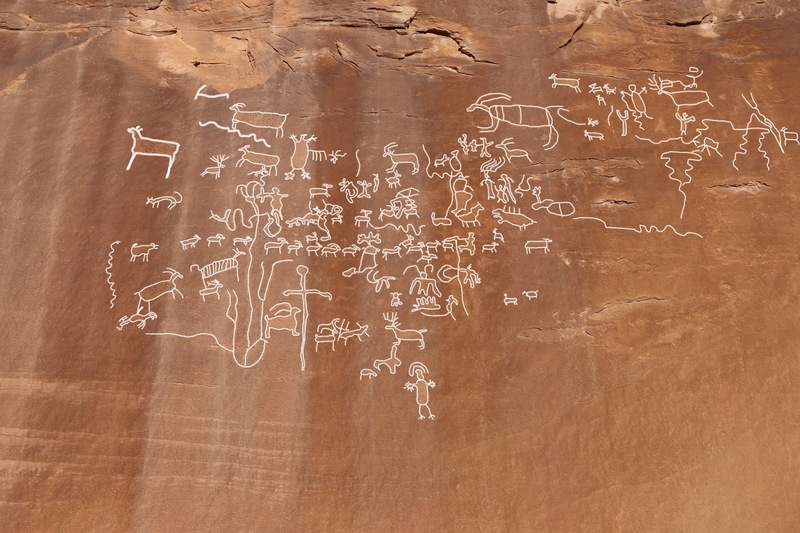 It has a long line of animal glyphs that include ones that resemble elk, bighorn, mountain lion and coyotes or dogs. There is one image that is holding a snake and a group of 3 that are dancing. The big pile of dirt and rocks in the middle of the cliff has apparently been there for quite some time as it has a few petroglyphs above it. They are easier to see from down below than they are from the top of the mound of dirt. High above the wash a little past the petroglyphs is a large cave that looks like a probable habitation site. Given more time it would be interesting to investigate further. We turned around at a spring that was just past the cave and headed back the way we came. On the way back it is worth hiking to the bottom of the spillover and checking it out. We hiked through the narrows on the way back. There are two spots going in this direction that require a bit of maneuvering to get up. As far as obstacles go they were more fun than difficult. We made a short detour on the way back over to a side canyon that had small caves on either side of it where we found a petroglyph that looked like a map of sorts. When we were at the other petroglyphs we noticed tracks that were coming in from Iron Wash. 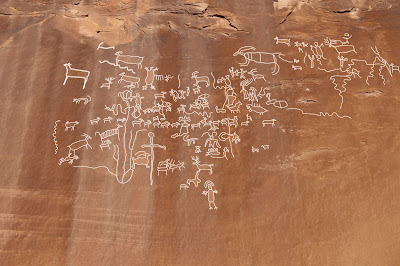 It looked like they rode in on ATV's to the spring and then hiked the remaining quarter mile to the petroglyphs. We had also considered doing that but then we would have missed out on the narrows, spillover, arch and a few other things. We have no trouble at all recommending the route that we took. If you would like to see it for yourself then all you have to do is 'Take a hike'.